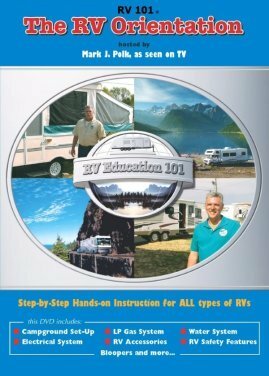 Staying warm in an RV can be quite challenging. Curtains, drapes etc. 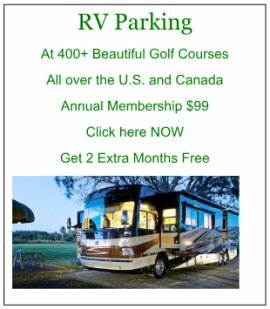 are very useful while blocking wind in your RV. 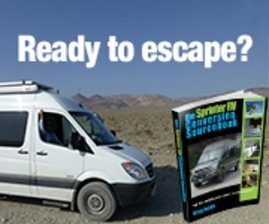 Traveling to the southern part of the US is not always an economical or convenient option. So what do you do? We typically try to stay in warmer areas but it may be too cold or too hot in the opposite season. That's one of the reasons we like Prescott, AZ. It can get cold during the winter months, but always warms up above freezing during the day. That makes a huge difference. The reason the temperature is so good here is the elevation - something I never really understood until we went full time. 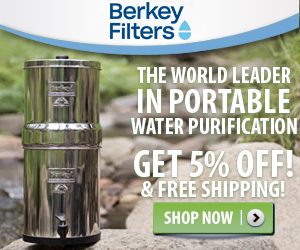 The elevation of wherever you are can have a significant influence on the daily temperatures. Phoenix area is pretty much sea level - hot as ever in the summer - too extreme. Flagstaff is about 9-11,000 ft elevation - too cold and snowy. Prescott is 5,000 ft - perfect! Best Solution? 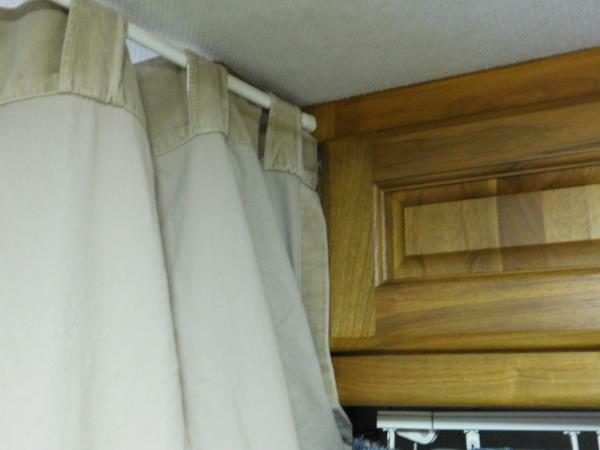 A set of floor length drapes across the front of your RV Living area - right behind the driver/passenger seats. Our first winter, we noticed quite a draft coming from the front of the RV. 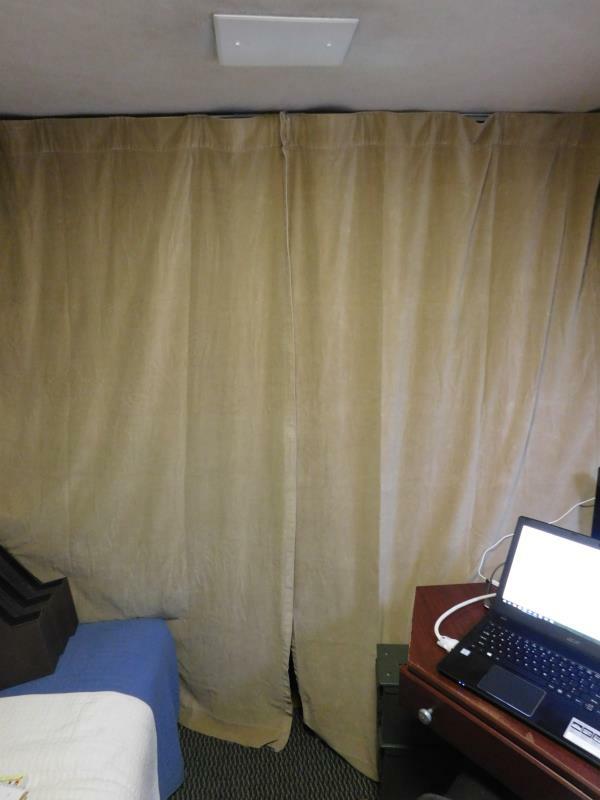 After much discussion and thinking, we got a thin compression curtain rod and a simple 2 piece drape that reaches from floor to ceiling. 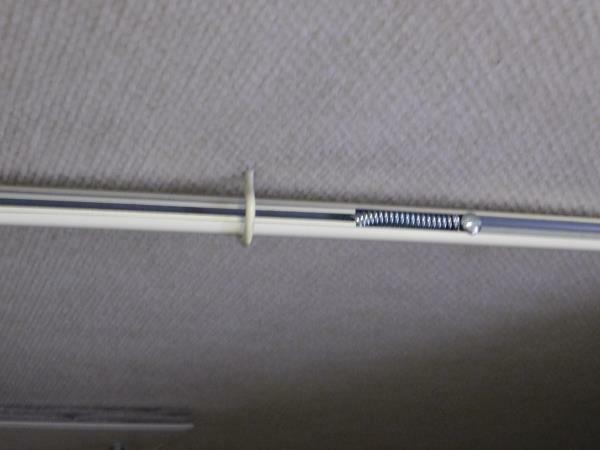 To help keep it up against the ceiling, we placed a small hook in the very center area of the ceiling. 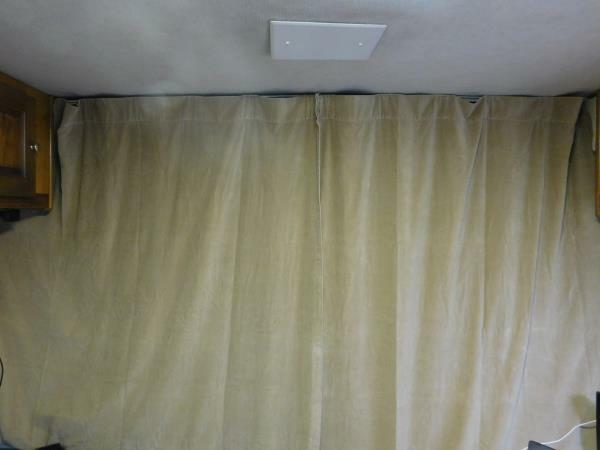 We attached several small strips of Velcro to hold the 2 curtains closed - works like a charm! Staying Warm in winter became sooo much easier!!! Here are 3 more detailed pictures to view. Yup..... we realized the front dashboard area - right at the actual glass of the windshield was also causing some drafts. Really cheap fix for that!! A pair of woman's tights and a bag of rice!!! 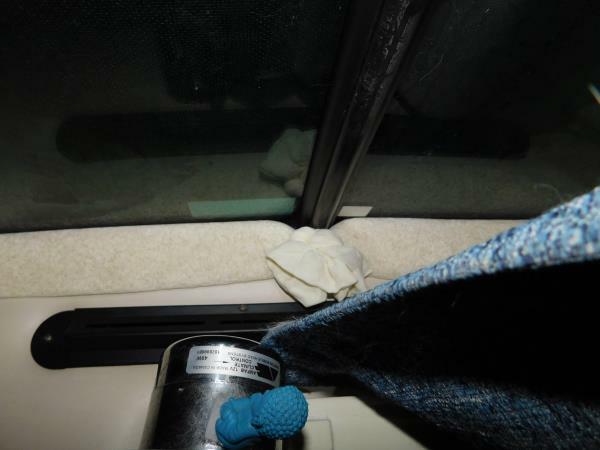 Filled the tights with rice and then laid them on the dashboard across the entire front of the RV - no more drafts!! 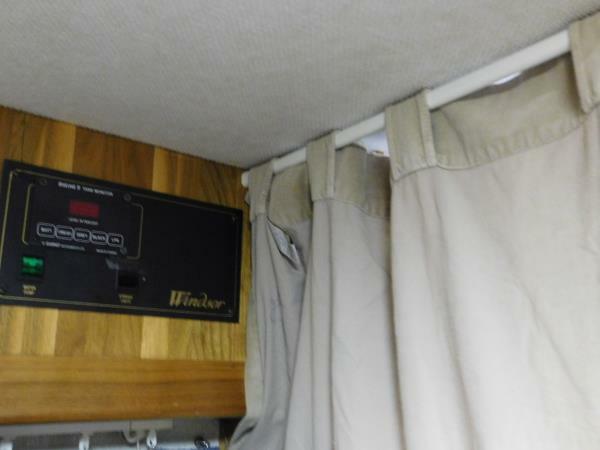 These two simple and economic solutions really cut down on the drafts we were feeling and has made a remarkable difference in the warmth we now have inside our "living area" of our RV. 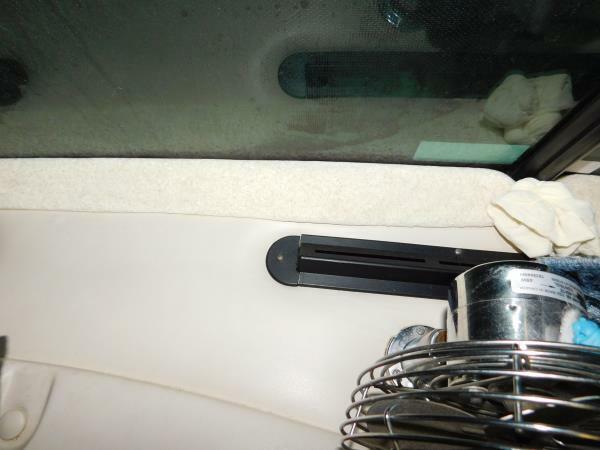 Update: We recommended rice as filler to stop dashboard drafts but on very cold nights the condensation tends to collect on the front windshield. The rice in turn gets wet and started to mildew in a few spots...not good. So I would instead recommend using Poly Pellets (not as cheap) but they won't mildew. The gap in dash is not large so 2 lbs was plenty for the entire length of our large windshield.